It is said that the kings of Siam had a subtle way of ruining those who disappointed them. They would gift them with a white elephant. A lavish and expensive present, the elephant cost the earth to keep. For the Buddha’s mother dreamt a white elephant presented her with a lotus flower before her son was born, and white elephants are deemed by the Siamese – those in modern-day Thailand – irrevocably, expensively sacred. A keeper of a white elephant must feed it special food, and make special arrangements for those who wanted to worship it. Very soon, there would be no money left for making a nuisance of oneself at court. A white elephant was veiled ruin for its recipient. The term white elephant has become synonymous with an expensive possession which has become a burden. Like the one we pass every time we pull into Waterloo Station on our way somewhere or other in the metropolis. Waterloo International Station attracted acclaim on its opening, in November 1994. My husband was part of the inaugural London to Paris run – a press jolly – and marvelled at the space-age glass structure, later accorded the Royal Institute of British Architects Building of the Year award. Nicholas Grimshaw & Partners were inspired not by an elephant: but by a pangolin. Yes: according to the Victoria and Albert Museum, the scaly anteater can take the credit for this futuristic creation which was, for a short time, the gateway to Europe. The endearing nocturnal mammal has keratin scales which overlap each other to protect its body. Its very name comes from pengguling – the Malay word for ‘curl up’. Waterloo’s terminal had to meet unique challenges, hosting high speed trains at the cusp of a new millennium: to be flexible, to be able to bend upwards, and downwards, and sideways. So it was constructed of glass panels: squares fixed only at their upper edges. The other three sides were free to move over the other panels , almost like a living pangolin’s surface. Ingenious: but defunct. For a high speed rail link connecting efficiently to St Pancras rendered Waterloo International surplus to requirements, and the four platforms which briefly became so glamorous now stand without a single arrival or departure, while different parties squabble endlessly about who pays for their conversion. Perhaps the planners should have given the plans for the London Pangolin a little more thought before giving the plans a go-ahead. The article about Charles Ribart in Wikipedia is a stub. It should be a new form of ignominious insult, the stub: too unimportant to attract the attention of any volunteer to write his entry, there is little information remaining about Charles and his work. Save for one glorious set of blueprints. The Arc De Triomphe is such a four-square solid declaration of French might it is hard to imagine anything else standing in its place. But had the planners who surveyed Waterloo International had a hand, centuries earlier in 1758, in looking at Charles Ribart’s work, it is just possible you might have seen a vast elephant straddling the Champs Élysées. 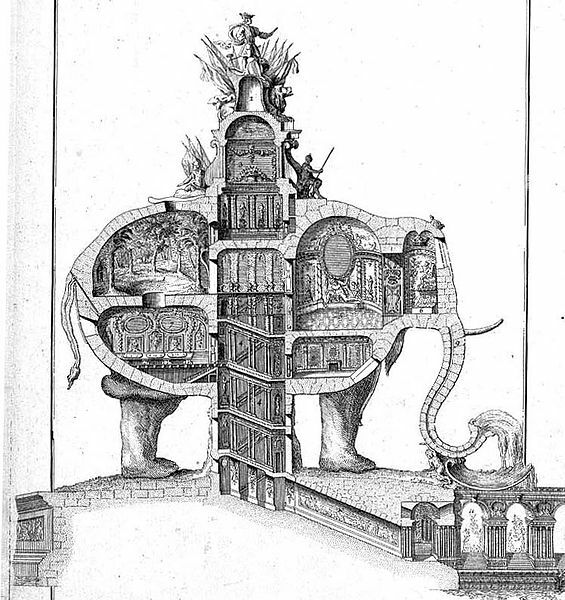 A building on three levels, his elephant would be accessed via a spiral staircase in its underbelly. Inside would be a ballroom, bathrooms and other function rooms. Much of the furniture was designed to fold up against the wall and air conditioning was built into the great colosus’s trunk. But the good planners of Paris were not of the same ilk as our twentieth century London ones. They took one look at the elephant, and uttered a perfunctory ‘Non’. And so it only remains to ask: are we glad we have a triumphal arch, and not a hatstand elephantine ballroom, steampunk before its time? Posted in London, Quirks of HistoryTagged Charles Ribart, elephant, Nicholas Grimshaw & Partners, pangolin, Waterloo International Station, zoomorphiaBookmark the permalink. I am certainly learning a lot from your wonderful blog! Me too, if truth be told, Julie. It’s one of the reasons I do this. Now it needs, not squabbles, but a competition to find an AMAZING use for it. It has already been the stage for a production of the Railway Children: but the people from my part of the world just want four extra platforms to reduce congestion on the platforms already working! Hmmm, note to self: rename the “white elephant” stall at the annual fete. Ha! It does make one think twice, doesn’t it, WonderingPilgrim? We have just watched transfixed, Roger. What a contraption! We were gagging for it to start walking….is it still, by any miraculous chance, around? I thought it was modelled on the anteater Kate – fascinating. I dreamt about a mechanical nonsense machine and it was remarkably similar to the elephant drawing. Another history lesson for me, thanks for sharing. I would prefer Pink Panthers compared to the white elephants that dominate USA government. St Pancras is my favorite station, maybe in the world. So, I’m not sorry for the poor pangolin. It would 😀 Though we get used to anything, given time. I wish they had built it, though. Wow, Kate — explaining the history of the term white elephant, introducing me to a pangolin and the Wikipedia stub-worthy Charles Ribart — my head’s spinning. I had absolutely no idea that an anteater could be the inspiration — intentional or not — for high speed rail travel on your side of the pond or that the Arc de Triomphe was almost a massive elephant on the Champs Élysées. Are you aware that Lucy, a possible relation of that elephant, lives to this day in New Jersey? And it’s New Jersey’s white elephant. I think it would be lovely, Debra: Paris’s planner of the time, not so much. The Arc is most worthy, but as much fun? Not nearly. I think an elephant standing astride the Champs Élysées would have been a triomphe! Very interesting, Kate. Around these parts we have what are called white elephant sales. This and that that folks want to get rid of and that someone is likely to buy for a pittance. I’ll have a bit of a chuckle, I’m sure, at the next white elephant sale I happen upon. The platforms will find new use. In BR days, they would have had a variety of non-international trains geting misdirected in there anyway. Southwest Trains has serious capacity issues so I would be very surprised if they weren’t granted access soon. I think someone is holding back in order to create political pressure for Crossrail 2 which would relieve Waterloo. The silliness of city planners — will they never learn? Interesting to learn where the term ‘white elephant’ originated and what it means — thanks again, Kate. There are a lot, come to think of it, Tandy: and there is less romance about Waterloo than many of our London stations. Howsomever, it’s home to us: our trains end up there. It is familiar in a battered kind of way. Had I been given the Waterloo commission, I would have created a gigantic flush toilet to befit the name. I hadn’t known why a white elephant was one – but our giant fruit-basket soccer stadium certainly fits the bill – or rather is providing a bill nobody wants to fit. White, too. They’re everywhere, Col….I think they are part of our human existence. It is perhaps, on this one occasion, fortunate you were not awarded the commission for Waterloo International.A white elephant toilet might be too much for us all to take. You have educated me this morning, Kate, on the origin of the term ‘white elephant’, and made me laugh (love ‘They took one look at the elephant, and uttered a perfunctory ‘Non’) 😀 Thanks. I’d say the French have enough of a headache with the 12 roads of traffic converging at the Arc de Triomphe that a white elephant would have superfluous. 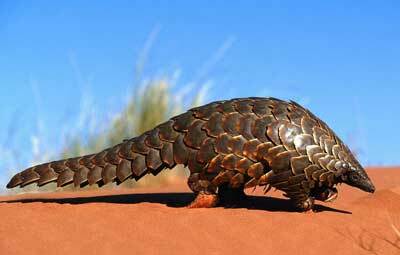 The pangolin.looks a lot like our armadillo. Some armadillo also roll up in a ball when attacked. I wonder if they are related. And, now I know the back story to a ‘white elephant.” Enjoyable, Kate. Dear Kate, sometimes I wonder about what governments as well as researchers choose to spend their money on. Peace.